Head to Franklin Park for sledding and other winter fun. Smells like team spirit at the Boston University hockey rink. 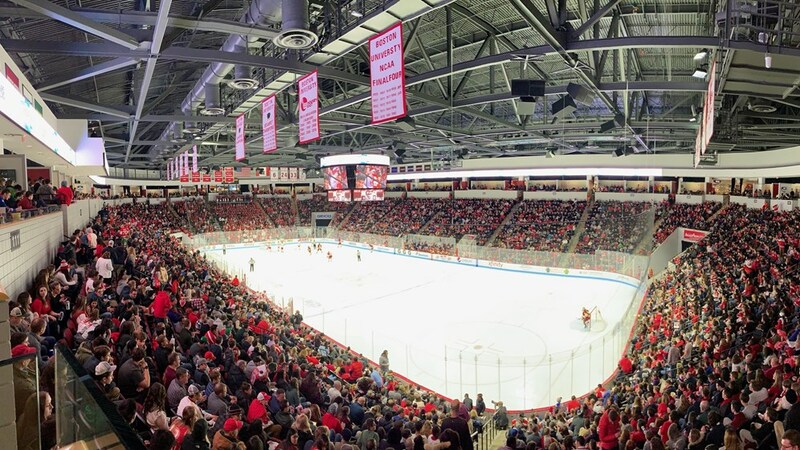 Get into the Boston team spirit at a Boston University hockey game. On Friday, February 1, the Terriers take on UMass for what’s sure to be a nail-biter. This hometown rivalry has all the excitement of a Bruins match without the hefty price tag. Plus, Boston wins no matter what the final score is. Don’t forget to wear your team gear! Warm up with winter flavors at Otto Pizza. Walk down the street for dinner at Otto Pizza, an artisanal pie shop imported from Portland, Maine. Warm up with cozy winter flavors like butternut squash with ricotta and cranberry or transport yourself to the Caribbean with a pineapple salsa, bacon and fresh jalapeño combo. You can show off your own athletic prowess with a round of corn hole after dinner. Enjoy margaritas and Mexican eats at Citrus and Salt. Start the day at Citrus and Salt for a margarita-soaked Sunday brunch. Daily ceviche selection or a dozen local oysters is a light way to begin before diving into goodies like fried chicken and waffle tacos or citrus-cured salmon tostados. More of a classic bruncher? Try huevos rancheros, a farmstead frittata with yucca hash, or avocado eggs Benedict. Hop on the T or walk 15 minutes to the Boston Opera House. Nothing says “Girls Day Out” like a group outing to “Beautiful: The Carole King Musical.” Sing along to your favorite songs (“Natural Woman,” anyone? ), and then learn about the highs and lows of this music legend’s life. The show follows King’s marriage to songwriting partner Gerry Goffin, her friendship with bestie Cynthia Weil, and her refusal to give up on her dream despite odds stacked against her. Head to the Franklin Park golf course for a day packed with family-friendly winter fun, courtesy of the Franklin Park Coalition and AMC Outdoors RX. If there’s snow, you and the kids can sled, build snow forts, or trek through the wintry terrain of the park. If there isn’t snow, the Franklin Park Coalition will host a nature walk instead. The air will undoubtedly be cold, so step inside and warm up with hot chocolate and art projects, or participate in group games with other families. Watch the USPS transform into artwork in the “Priority Made” show. Drive or take the 22 bus 10 minutes to the Dorchester Art Project to view their current exhibit “Priority Made.” The show features works by a group of artists using the Label 228 USPS Postal Sticker, which has been made iconic by graffiti artists. You can observe a timeline of different designs of the sticker and see how different artists have used it in different ways.